For the second time in the past year, Washington activists blocked a train carrying oil fracking supplies from leaving the Port of Olympia on the Salish Sea The blockade camp prevented a possible shipment of ceramic proppants from being shipped to the Bakken oil shale basin in North Dakota, and possibly other fracking operations. The proppants are used to prop open bedrock cracks during the process of fracking (or hydraulic fracturing) for Bakken oil. The “Olympia Stand” assembly and other port resistance activists demanded that the Port of Olympia cease all fossil fuel-related and military shipments. The activists’ press release demanded that “The Port of Olympia cease all fossil fuel and military infrastructure shipments,” and accept “Horizontal and democratic control of the Port of Olympia by the community” and “A “just transition” for port and rail workers to good, green jobs, and for the economy of Thurston County to a cooperative, sustainable and just economy.” It also demanded “Consultation on all port issues and projects that could impact the tribal treaty lands, traditional lands, and ceded lands of local Medicine Creek Treaty Tribes. Also, consultation with local urban Indian peoples who are often disproportionately negatively impacted by governmental and industry actions.” The blockade was set up on November 17, exactly one year after police broke up a similar blockade. The Port of Olympia has been the focus of previous blockades related to oil wars at home and abroad. Intense protests opposed military shipments of Stryker armored vehicles to Iraq from nearby Joint Base Lewis-McChord (then Fort Lewis) in 2006-07, resulting in multiple arrests and injuries. A decade ago, in November 2007, Olympia police cracked down on a women’s antiwar port action blocking trucks at the port gates. Starting in 2012, the Texas-based Rainbow Ceramics company began to import proppants from China to the Port of Olympia, where the 1.5-ton sacks of “fracking sands” were loaded onto trains to the Bakken oil shale basin of North Dakota. Local community organizers held a series of protests at the port gates, which picked up support in Fall 2016 after Standing Rock water protectors challenged the Dakota Access Pipeline carrying the same Bakken oil. November 10, 2016, just after the Trump election, Olympia Stand activists mounted a week-long blockade of a train carrying fracking proppants from the Port of Olympia. They used banners such as “Water is Life” and “Oil = Death” to dramatize their solidarity with the Standing Rock and Quinault water protectors, and began to learn from an Indigenous Caucus about respectful protocol to follow when working with Native communities. 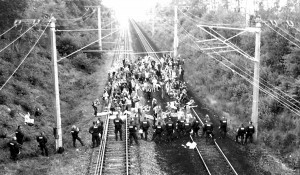 As hundreds of people joined the train blockade, negotiations were opened with the City of Olympia. But Port Executive Director Ed Galligan had been told that Rainbow Ceramics officials were concerned that if they did not get a shipment to two companies doing business in North Dakota and Wyoming, they “run the risk of losing their business.” In the early morning hours of November 17, 2016, a combined force of Washington State Patrol, Olympia Police Department, and Thurston County Sheriff’s Department raided the encampment, making 12 arrests. The forceful eviction left serious bruises on some activists, even if Olympia Police Chief Ronnie Roberts and City Manager Steve Hall later claimed there were no injuries. Chief Roberts later criticized the Port for causing the civil conflict by accepting the proppant shipments. Olympia Stand’s 2017 blockade took place one year after the police raid, one day after a Keystone oil pipeline spill in South Dakota, and the same week as the United Nations Framework Convention on Climate Change exhibited a lack of meaningful progress in Bonn. The water protectors’ press release noted that in the year between the two blockades has been “the hottest year to ever be recorded on earth, saw the brutal, militarized repression of the Standing Rock Sioux Tribe and their resistance to the Dakota Access Pipeline, as well as one of the most destructive storm seasons in living memory, with thousands of lives lost to climate change-amplified hurricanes, typhoons and floods, from Houston, to Bangladesh to Puerto Rico.” According to the press release, “Olympia Stand and other participants believe climate change can be stopped by engaging in non-violent direct action and civil disobedience against fossil fuel infrastructure, from train blockades and Port shutdowns to occupations of pipeline construction sites. Policymakers can continue to take no action on this issue, and doom future generations to an uninhabitable planet, or they can follow the lead of people around the world fighting for a Just Transition away from fossil fuels and extractive economies. 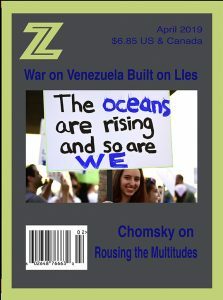 Meanwhile, we will continue to fight, whether they like it or not.” The blockade also took place a day after incumbent Port commissioner Bill McGregor, who has supported the fracking proppant shipments, narrowly won re-election to the three-member Port Commission, as incumbent commissioner and fracking opponent E.J. Zita handily won re-election. Since the Progressive era, Washington port commissioners have been elected to office, and recent port elections have become a key forum for climate justice activism in the state, as they oppose the complicity of their ports in fossil fuel extraction. At a Port meeting on March 24, 2014, McGregor said that he was “still not convinced” that climate change may result in serious sea-level rise. He claimed to have read that “all we’ve done to try to eliminate CO2 emissions, and that type of stuff, are taken care of in four days when a volcano erupts.” When an audience member challenged him to provide a citation on a claim that is “not true,” McGregor replied, “I only tell you what I read, and I’m not going to get in a discussion.” The fact is that sea-level rise will affect our ports in this century. As early as 2008, a report from the EPA and American Association of Port Authorities asserted that “Common sense suggests that ports are at particular risk from climate change due to their geographical locations.” If McGregor claims that climate change is caused by volcanoes, rather than burning fossil fuels, it perhaps explains why he has no problem shipping supplies for oil fracking, and risking sea-level rise that could one day inundate the port itself. The Port of Olympia train blockade is only one part of larger and powerful regional climate justice movement, using the strategic location of the Pacific Northwest as a “chokepoint” for the fossil fuel industry. The three most active fossil fuel basins are in the interior of the continent—in the Alberta tar sands, Bakken oil shale basin, and Powder River coal basin. The fossil fuel industry needs new Pacific Northwest port terminals both to export its oil, coal, and natural gas, and to import extraction equipment and supplies. Shipping has become the vulnerable Achilles heel of the fossil fuel industry in the Pacific Northwest. The Seattle-based Sightline Institute terms the region a “Thin Green Line” of climate-conscious citizens who stand between the fossil fuel companies and the global market. In the past decade, the industry has proposed 14 new oil or coal terminals in Washington and Oregon, and all have been defeated or are near defeat by water protector alliances. Using their treaty rights (upheld by the 1974 Boldt court decision), Northwest tribal nations have protected their fishery from oil and coal spills, and led the way for the grassroots alliances. Since last year, the Lummi Nation and its allies defeated the Cherry Point proposed coal terminal (leading to the cancellation of a coal mine at the other end of the coal train route in Montana), and the Quinault Nation and allies defeated three oil terminals that would have brought in explosive Bakken oil trains to the Washington coast. In Washington state, just in the past week, a proposed coal terminal in Longview and proposed Bakken oil terminal in Vancouver appear to be on their last legs. The Puyallup Tribe is currently leading the opposition to a proposed Liquified Natural Gas (LNG) terminal in Tacoma. These tribally led alliances not only have included environmentalists, but some of the white fishing communities and local governments that once opposed treaty rights and environmental regulations. Over the weekend, the blockade encampment has become a scene of meetings, assemblies, cooking, singing, and drumming. 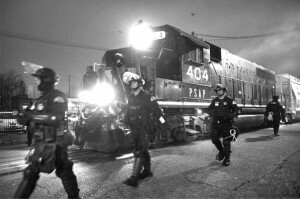 Even if the Olympia train blockaders are again removed by police in coming hours or days, they are part of a larger regional movement taking responsibility to act in the face of the climate crisis, and using their strong geographical position to literally stand in the way of the fossil fuel industry.